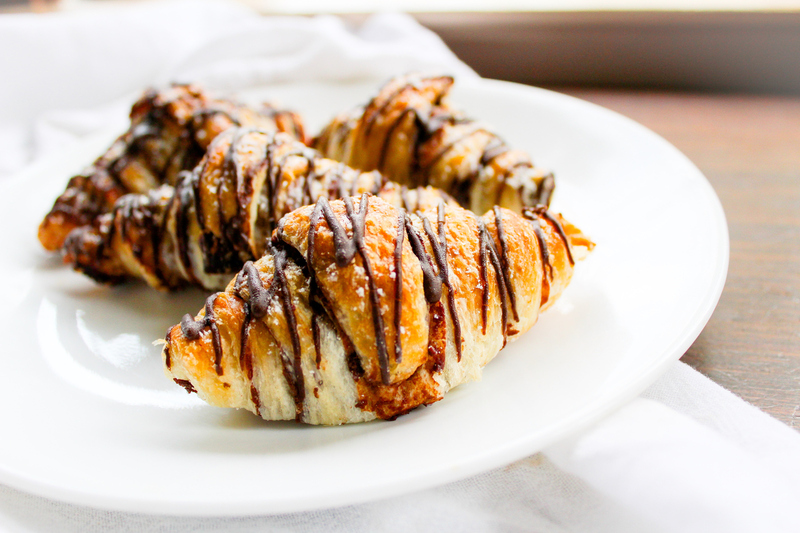 Start your day the right way with a plate of these flaky vegan chocolate hazelnut croissants! Preheat oven to 180ºC. In a food processor, or high-powered blender, place raw hazelnuts. Pulse, scraping the sides down regularly, until a smooth, thick nut butter forms. This can take between 15-25 minutes, depending on your appliance. Nuts will become a crumb first and then release their oils to transform into a smooth paste, so patience is key! Add in the maple syrup and cocoa powder and process again until combined. If the nut butter is too thick, two teaspoons of peanut oil can be blended in to thin it out to a spreadable consistency. Cut square of defrosted pastry in half, into a rectangle. Within each rectangle, cut diagonally from corner to corner, creating two triangles – or four in total for the sheet. Spoon approximately one tablespoon of nut butter on the wider end of the pastry triangle and spread upwards for about one third of the pastry. From the larger end, roll pastry up. Bend sides to make a croissant crescent shape. Place croissants on a tray lined with baking paper, and brush each one with the soy milk taking care not to make the pastry too moist. Bake for 25 minutes, or until golden and crispy. Drizzle the croissants with the melted dark chocolate.